A mediator (or mediating) variable is an integral part of a cause-effect relationship. It makes it easier to understand how the independent variable is affecting the dependent variable and what is governing that relationship. This is a continuation of an article that explained what independent and dependent variables are and what a conceptual framework should contain. The example we used in that article was the story of Ben, a student who put in many hours of studying (independent variable) in order to get a higher score on his exam (dependent variable). Now we’ll expand the original framework by adding a mediator variable. A mediator variable comes between an independent variable and a dependent variable in a cause-effect relationship and allows that relationship to be better explained. If you’re not familiar with the terms independent variable and dependent variable, you can learn more in the above mentioned article on conceptual frameworks. Mediator variables can be very difficult to interpret and care must be taken when conclusions are being drawn from them. It is therefore critical that mediator variables are always underpinned by statistical analysis. The complexity involved is beyond the scope of the article, so we won’t go into great detail. Instead we’ll focus on helping you develop a basic understanding of what a mediator variable is and when it may need to be considered. In this example, the relationship between the independent variable (“hours of study”) and the dependent variable (“exam score”) plays center stage. As established previously, the cause-effect relationship is that the more hours Ben studies, the better he will do on the exam. However, now we have added the mediator variable of “number of practice problems completed.” As you can see in the figure above, the mediator variable comes between the independent and dependent variables. The more hours Ben studies, the more practice problems he will complete; the more practice problems he completes, the higher his exam score will be. 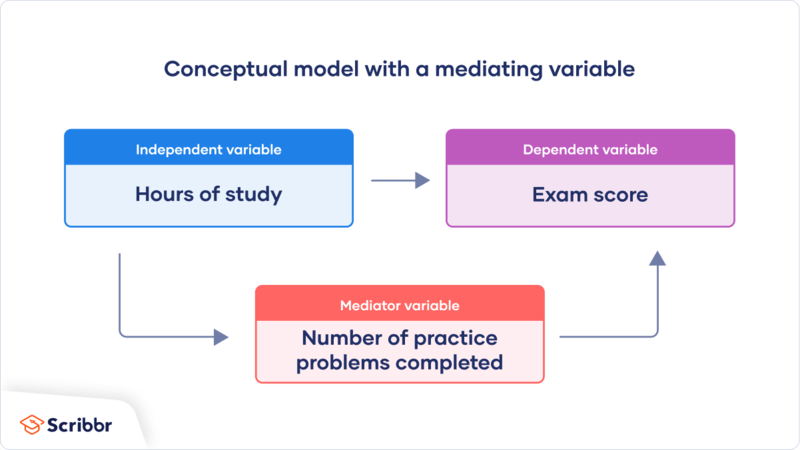 By adding the mediator variable of “number of practice problems completed,” we strengthen the cause-effect relationship between the two main variables being explored. It’s important not to confuse a mediator with a moderator. To illustrate the difference, try thinking about the “IQ” moderator that we introduced to our conceptual framework in the article on moderator variables. The moderator of “IQ” is not a mediator variable, because the number of hours Ben studies (the independent variable) does not affect his IQ. No matter how many hours Ben studies, his IQ will not increase. These articles continue building on the example of Ben and his quest for a perfect exam score.